2. Click on 'Create a New File'. Note: the file submitted for each pay period is saved so that it can be reused and changes to amounts and bank numbers can be made for the next pay period. 3. 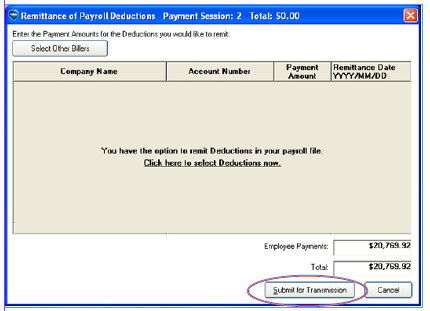 Enter in a reference number, the name of the employee, their banking information and the net amount for this pay period. 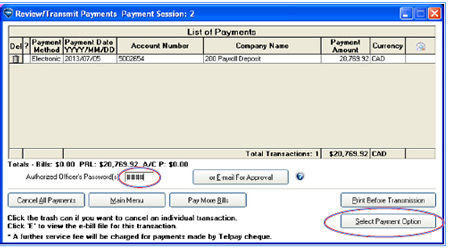 4.Enter the "Date of Deposit to Accounts" and click 'Next'. 5. 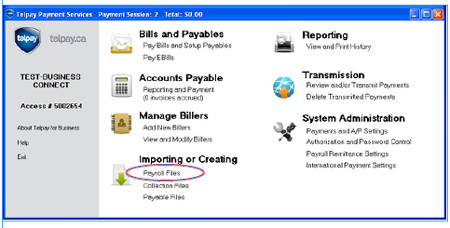 You have the option to remit your payroll deductions along with your payroll or use the bill pay functionality of Telpay for Business. Please refer to our government remittance/source deduction processing instructionsor contact our Customer Service Team for information. Select 'Submit for Transmission'. 6. 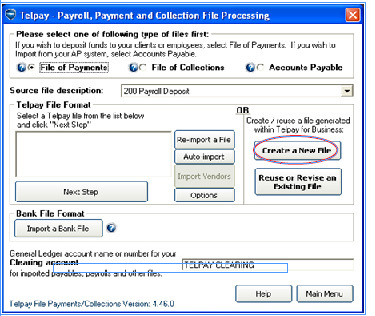 A copy of the payroll register can then be printed. 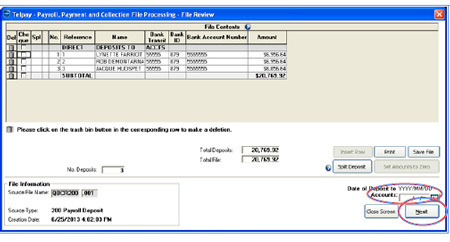 Once you have printed the report you will be prompted to confirm the contents of the file by clicking on 'Confirm' for each item. 7. Once you have confirmed everything click on 'Next'. 8. You will be prompted for your authorized officer’s password(s) or e-mail for approval. Once you have entered the password(s), select 'Select payment option'. 9. 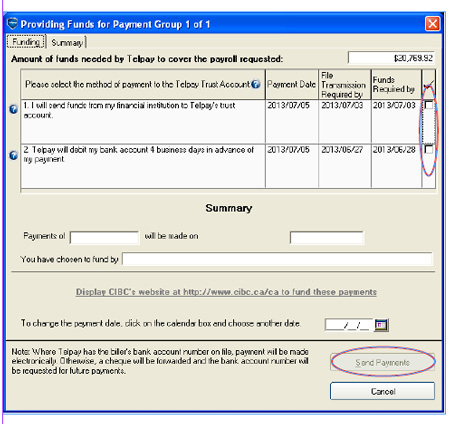 Choose your preferred funding time option and select 'Send Payments'. 10. Once your system has successfully connected to Telpay, you will receive a Transmission Report which you can print or continue. This report will be stored in the history of your Telpay for Business software. 11. You will then be required to back up your system. Select a network drive or an external drive. Then click 'Backup'. I am ready to process my second (or third, or fourth...)QuickBooks payroll run. Is this process any different than my first payroll run?